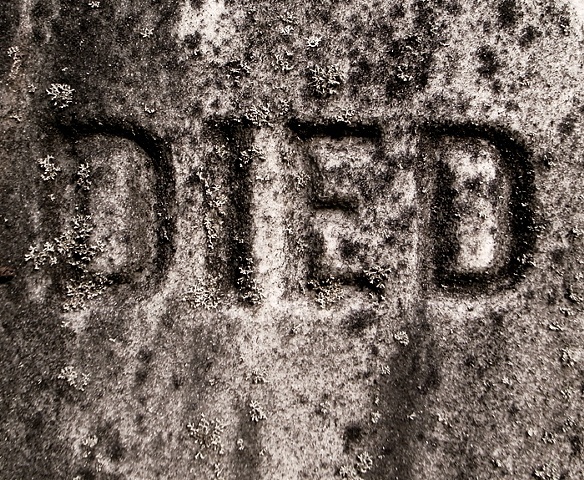 The “Died Series” is an exhaustive photo documentation of every tombstone in a cemetery taken over the course of one day in the spring of 2009. Isolating and framing the word “Died” in each of several hundred photographs, the artist draws our attention to the skill of the carver, the quality of stone, the evolution of fonts over several eras, and most importantly, the stone’s erosion and its subsequent surrender to nature. Specifics of the deceased are seldom included in the frame, thus memory, loss & anonymity become inherent themes of the work. The effects of weather and the success of nature lead to the obliteration of words even in material as solid as stone. When seen in completion, the “Died Series” is a fascinating testament to the beauty of decay, and the ceaseless passage of time. Through his dedicated precision, the artist proves each image to be as unique as the individual buried there.